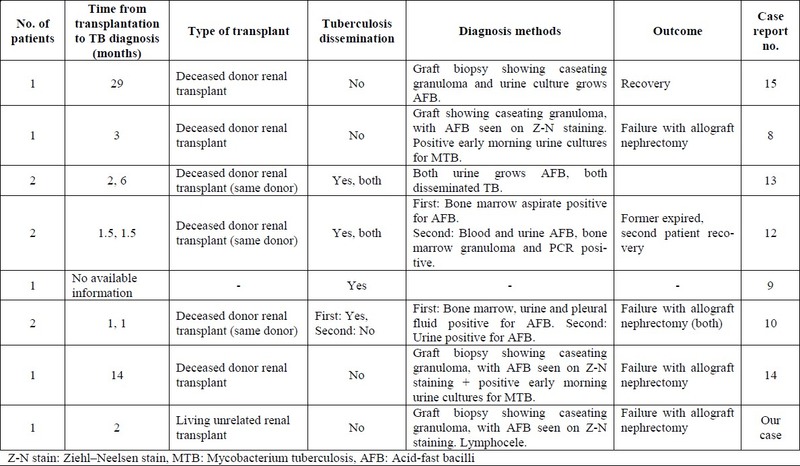 Table 1: Tuberculosis isolated to renal allograft transmitted from donor with or without dissemination of tuberculosis by case reports and case series. A 53-year-old Qatari female patient with chronic kidney disease secondary to long-standing diabetes mellitus (DM) and hypertension, had two live unrelated renal allograft transplants. The first transplant was performed in 1993. She sustained chronic allograft rejection and ended up in transplant failure in early 2000. The second renal transplant was performed in November 2005. The transplantation was carried out in a different center (in Philippines) with a haplo-matched donor. Further detailed information about the donor was not available. It was followed by multiple complications, including dehiscence of the transplant wound with a sinus having persistent discharge from lymphocele. She developed allograft dysfunction; the initial one was secondary to cyclosporine toxicity proven by the allograft biopsy in December 2005. She was re-admitted in January 2006 with rising urea and creatinine. She was complaining of abdominal pain and low-grade fever. Escherichia coli wound infection was found and was treated initially, but the patient continued to be febrile. There was no past history of TB in the patient or in her family. Purified protein derivative (PPD) skin test was negative prior to transplantation. No isoniazid (INH) prophylaxis was given. She was maintained on multiple immunosuppressant drugs including mycophenolate mofetil, cyclosporine and prednisolone. Physical examination showed a febrile patient (38.2°C) with stable hemodynamic status. There was no lymphadenopathy or rash. Retina examination showed no evidence of choroidal TB. Abdominal examination revealed left side palpable allograft kidney. Other systemic examinations were unremarkable. The initial investigations showed hemoglobin 6.9 g/dL, total leukocyte count 2100/mm 3 , polymorphs 38.6%, lymphocytes 48% and platelets 125,000/μL. The erythrocyte sedimentation rate was 102 mm in the first hour. Urine examination was negative and no acid-fast bacilli (AFB) was seen in Ziehl-Neelsen (Z-N) staining. Serum urea was 15.5 mmol/L, creatinine was 128 μmol/L and calcium was 2.17 mmol/L. Blood and urine cultures done this time were sterile. Chest X-ray and computed tomography (CT) scan of the chest were normal. Ultrasound, CT scan and magnetic resonance imaging of the abdomen showed a large lymphocele surrounding the transplant, with normal angiographic appearance of pelvic veins and arteries, atrophic native and normal-appearing renal graft. There was no evidence of TB at any site. Transplant renogram showed normal perfusion with normal parenchymal appearance. Repeated gram staining and cultures of lymphocele fluid were negative. However, lymphocele fluid was reported positive for AFB staining and the culture grew Mycobacterium tuberculosis. The second transplant kidney biopsy showed tubulo-interstitial inflammation with non-caseating granulomas with AFB seen on Z-N staining. There was no evidence of concomitant fungal infections [Figure 1]. 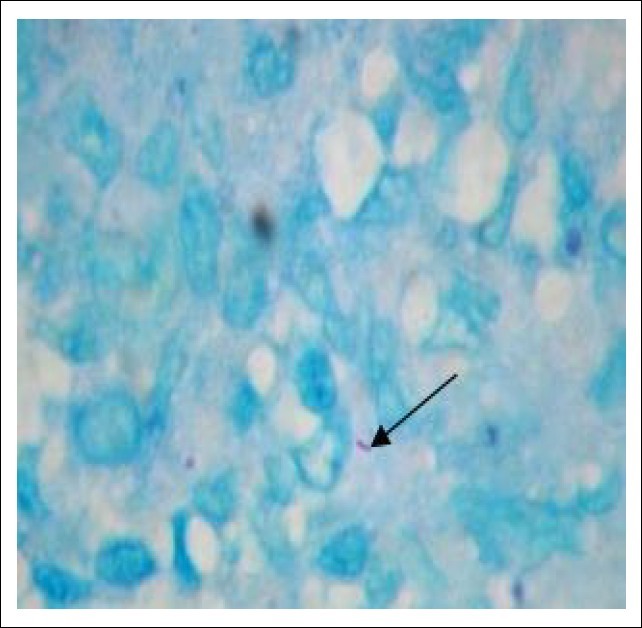 Figure 1: Renal allograft biopsy showing acidfast bacilli was stained positive (modified Ziehl– Neelsen stain) seen in granuloma (arrow). The patient was started on full-dose quadruple anti-tubercular therapy (rifampicin, isoniazide, ethambutol and pyrazinamide). Despite the early diagnosis and treatment, the patient continued to have deterioration of the kidney function associated with symptomatic volume overload requiring hemodialysis. Because of persistent fever despite anti-tubercular and empirical antifungal therapy, although with no apparent focus of fungal infection, transplant nephrectomy was performed. Histopathology of the removed graft was positive for fungal hyphae and spores; however, no culture was performed. After nephrectomy, the patient responded well to treatment. She was continued on anti-tubercular therapy for a total of one year. She is currently maintained on regular hemodialysis without evidence of tuberculosis reactivation. The diagnosis of TB is often made retrospectively after observing a complete response to anti-TB therapy. The most common site for TB is pleuro-pulmonary in renal transplant patients, accounting for 28-50%, followed by disseminated TB. Patients presenting with pyrexia of undetermined etiology account for 20-40%. Examination of the retina is important to differentiate disseminated TB from isolated graft infection. The other method is by bone marrow examination, which is not routinely done. Moreover, our case was unusual compared with previously reported cases as the transmission occurred from a live unrelated transplant rather than a deceased donor transplant [Table 1]. The initial renal graft biopsy was negative for presence of granulomatosis disease. We believe that the reason for that is related to the nature of granulomatosis that was scattered throughout and not involving the whole organ. Possibly, the first biopsy missed an area with granulomas. Also, it is important to mention that superinfection with E. coli masked the presentation. Moreover, the fungal infection that involved the transplanted kidney was not present at the beginning and it was not shown in either biopsy taken earlier. The immunosuppression was stopped with nephrectomy performed in order to gain control of the infection. These are common problems with this type of patient. TB of the renal allograft should be seriously considered in any transplant patient with pyrexia of unknown origin. Renal allograft biopsy should be performed as early as possible for every transplant case where a cause for fever is not reached. Because it often goes unsuspected, a high index of suspicion is needed to diagnose it timely in order to avoid graft loss. TB transmitted with the organ donor should be thought of if the donor status is unknown or if the donor is from endemic areas. Other recipients from the same donor should be checked as well. The authors of this manuscript have no conflicts of interest to disclose as described by the Saudi Journal of Kidney Diseases and Transplantation. Also, this manuscript was not prepared or funded by any commercial organization. 1. Singh N, Paterson DL. Mycobacterium tuberculosis infection in solid-organ transplant recipients: Impact and implications for management. Clin Infect Dis 1998;27:1266-77. 2. Sakhuja V, Iha V, Varma PP, loshi K, Chugh KS. The high incidence of tuberculosis among renal transplant recipients in India. Transplantation 1996;61:211-5. 3. Wong TY, Szeto CC, Ho KK, Leung CB, Li PK. Successful medical eradication of tuberculosis paranephric abscess in renal transplantation. Nephrol Dial Transplant 1999; 14: 1288-90. 4. Jha V, Chugh S, Chugh KS. Infections in dialysis and transplant patients in tropical countries. Kidney Int 2000;57:S85-93. 5. Biz E, Pereira CA, Moura LA, et al. The use of cyclosporine modifies the clinical and histopathological presentation of tuberculosis after renal transplantation. Rev Inst Med Trop Sao Paulo 2000;42:225-30. 6. John GT, Shankar V, Abraham AM, Mukundan U, Thomas PP, Jacob CK. Risk factors for post-transplant tuberculosis. Kidney Int 2001; 60:1148-53. 7. John GT. Infections after renal transplantation in India. Indian J Nephrol 2003;13:14-9. 8. Basiri A, Moghaddam SM, Simforoosh N, et al. Preliminary report of a nationwide case-control study for identifying risk factors of tuberculosis following renal transplantation. Transplant Proc 2005;37:3041-4. 9. Mansour AM. Renal allograft tuberculosis. Tubercle 1990;71:147-8. 10. Naqvi R, Akhtar S, Noor H, et al. Efficacy of isoniazid prophylaxis in renal allograft recipients. Transplant Proc 2006;38:2057-8. 11. TB Unit of the WHO Regional Office for Eastern-Mediterranean Region: Country profile 2008-2009: QATAR. 12. Siu YP, Tong MK, Leung KT, Yung CY. Successful kidney re-transplantation in a patient with previous allograft kidney tuberculosis. Transpl Infect Dis 2004;6:132-5. 13. Qunibi WY, al-Sibai MB, Taher S, et al. Mycobacterial infection after renal transplantation-report of 14 cases and review of the literature. Q J Med 1990;77:1039-60. 14. Peters TG, Reiter CG, Boswell RL. Transmission of tuberculosis by kidney transplantation. Transplantation 1984;38:514-6. 15. Transplantation-Transmitted Tuberculosis - Oklahoma and Texas, 2007. MMWR Morb Mortal Wkly Rep. 2008;57:333-6. 16. Mourad G, Soulillou JP, Chong G, Pouliquen M, Hourman M, Mion C. Transmission of Mycobacterium tuberculosis with Renal Allografts. Nephron 1985;43:82-5. 17. Graham JC, Kearns AM, Magee JG, et al. Tuberculosis transmitted through transplantation. J Infect 2001;43:251-4. 18. Malone A, McConkey S, Dorman A, Lavin P, Gopthanian D, Conlon P. Mycobacterium tuberculosis in a renal transplant transmitted from the donor. Ir J Med Sci 2007;176:233-5.